Bedrock underlying upper Moore Creek is Upper Cretaceous undifferentiated sedimentary rocks consisting of interbedded sandstone and shale. The placer deposit occurs in multiple ages of ancestral terrace gravels and in modern stream gravels. The older terrace deposits are inferred to be Late Tertiary to early Pleistocene, based on similarities with other dated deposits in Interior Alaska (Hopkins and others, 1971). Pleistocene fossils (mammoth and horse bones) in the overburden were dated at 36,000 BP with radiocarbon methods (Jeff Kline written communication, 1986). In the modern stream gravel is about 10 ft (3.0 m) thick. On the bench placers the gravel is only about 3 ft (1 m) thick and covered by 2 ft (0.61 m) of clay and vegetation (Mertie and Harrington, 1924). The paystreak is about 1.9 mi (3 km) long and 330 to 1310 ft (100 to 400 m) wide. Pay gravels range from 13 to 20 ft (4 to 6 m) thick and are overlain by 5 to 6.6 ft (a.5 to 2 m) of overburden. 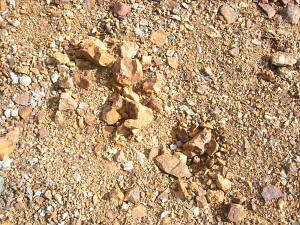 Gold is concentrated at the base of the gravel and the upper 1.5 ft (0.46 m) of bedrock. The gold is associated with considerable vein quartz. Reported gold fineness ranges from 746 to 883 with averages in the high 700’s (Smith; Metz & Hawkins), which is low compared to other deposits in the Innoko and Iditarod districts. Nuggets up to 19 ounces have been located in recent years. A $2000.00 nugget is reported to have been found on Nevada Gulch in the early years (D. Harris, personal communication, 2003). If true this nugget would have been in the 100 ounce range given early gold prices. The principal heavy minerals identified in concentrates include native gold, cinnabar, scheelite, native silver, tetrahedrite, chromite, magnetite, and zircon (Mertie, 1936; Bundtzen and others, 1987, 1988; McGimsey and others, 1988). Concentrates from mining contain up to 35.00 percent chromite, i.e., a low grade chrome resource. A mineral separate of screened, minus-28-mesh material from a 100-kilogram, bulk sample of gravel contained 2,300 parts per million (ppm) chromium, 5,200 ppm titanium, 70 parts per billion (ppb) palladium, 200 ppm nickel, and 8.25 percent iron (Bundtzen, Laird, and Lockwood, 1988). Although the nuggets contain abundant quartz rock, the tailing piles are remarkably lacking in quartz. However, abundant large agates occur, derived from the volcanic rocks in the area. A piece of cinnabar was found with agate attached (S. Herschbach). 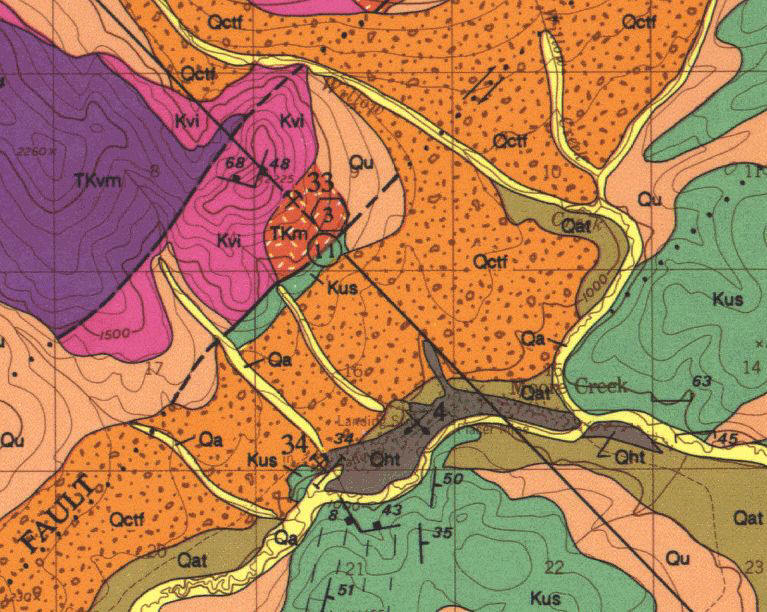 The source of the gold is probably a mineralized monzonite intrusion and associated contact zones about 1.2 mi (2 km) northwest and upstream from the placer deposit (see AMIS 730057, Broken Shovel). Gulches converging on the intrusion have all been mined for gold. The northeast trending Iditarod-Nixon Fork fault forms the southern structural boundary of the intrusion. It is postulated that the Late Tertiary to possibly Late Pleistocene placer deposits at Moore Creek may have been successively offset right laterally by transcurrent movement along the fault. This would make the deposits progressively younger to the northest (Bundtzen and others, 2004). Many of the large gold/quartz specimens have monzonite attached, indicating a source within the intrusive. Some specimens have more black tourmaline attached than quartz indicating a possible association with tourmaline zones within the monzonite intrusive. The Broken Shovel prospect consists of a N20 deg. E-trending, steeply dipping quartz-dolomite sulfide vein hosted in medium grained monzonite of the Late Cretaceous 68.9 Ma Moore Creek pluton. The vein is about 5 ft (1.5 m) wide and can be traced for at least 660 ft (200 m) along strike. The vein walls have been sericitized and a pocket of tourmaline is located near the southwest end of the vein. Grab samples contained 555 ppm (16.2 oz/ton) silver, 1.6 ppm gold, 4,860 ppm copper, and 1,430 ppm lead. Visible gold, arsenopyrite, scheelite, and lead-antimony sulfosalts have been identified in hand specimen (Bundtzen and others, 2004). Inferred resource: 15,980 tons (14,500 tonnes) grading 150 gm/ton (4.4 oz/ton) silver and about 1.0% combined base metals (Bundtzen and others, 2004). Form 1911 to 1986 at least 53,990 oz (1679 kg) of gold and 12,520 oz (390 kg) of silver were produced from placer operations on Moore Creek. Cleaning of a 30,000 sq ft area of bedrock produced approximately 294 oz (9144 gm) of gold. This calculates to an average grade of 0.01 oz (0.31 gm) per bedrock foot. More than 70% of the production occurred from 1930 to about 1955. About 1,383 ounces of gold and 64 ounces of silver have been produced from Nevada Gulch, mainly from 1911 to 1929. Mining in the 1980s concentrated on recovering coarse nuggets from previously mined ground (Mertie, 1936; Bundtzen and others, 2004. The current claim owner recovered 23.5 oz (666 gm) of mixed gold-quartz nuggets in 30 hours of metal detecting placer tailings (S. Herschbach, personal communication, 2003). Inferred resource: Minimum of 11,000 cy (8410 cu m) of gravel with potentially significant gold content. An unknown amount of gold remains in the 1.5 million yards of tailings. Much of the tailings are worthless stacked overburden, but others appear to contain significant amounts of recoverable gold. A 9 yard sample of one tailing pile run through a 6″ suction dredge in 2004 averaged 0.023 oz (0.72 gm) per cu yd while another 9 yard sample of another tailing pile averaged 0.012 oz (0.37 gm) per cu yd. 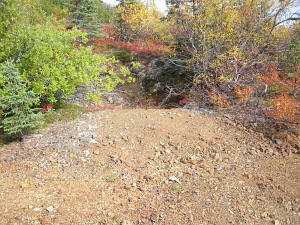 Full Metal Minerals and Highbury Projects have been engaged in hardrock exploration on the property since 2006. Trenching below the Broken Shovel prospect in 2007 discovered widespread gold mineralization, with high assay returns from two distinct zones. The Troy Zone is typified by quartz veins with strong coarse gold mineralization within a broad, lower grade zone. Assays from this zone ran as high as 88.5 g/t Au over 0.2 meters occurring within a 3.0 meter channel that averaged 7.6 g/t Au. The Spring Zone is right at the base of the hill and is made up of sheeted quartz-tourmaline veins with coarse gold and disseminated sulphides. Seven trenched spanning 300 meters of strike length were completed, and all contained gold mineralization across the full length of the trenches. Trench 20 averaged 8.86 g/t Au over 11.0 meters. See details at the Full Metal website and a close-up photo of Spring Zone mineralization. Follow-up drilling in 2008 had indeterminate results due to the highly fractured nature of the host rock and other difficulties encountered during the operation. Operations since have been hampered by the severe economic downturn. Annual report for Full Metal Minerals Inc. on the Moore Creek prospect, Alaska – Nicholas Van Wyck, Ph.D. C.P.G., February 2007 – Summary of results from 2006 field exploration at Moore Creek. 24 pages. Observations on a Concentrate Sample from Moore Creek – Professor Emeritus Jacques Jedwab, Brussels University, Belgium., 2006 – Analysis of a placer sample collected by Michel Zavadsky in 2006 at Moore Creek under light microscope, electron microscope, and electron microprobe. 800kb pdf file. Gold Compositional Analysis of the Moore Creek Placer – Nicholas Van Wyck and Rainer Newberry, November 2006 – Microprobe analysis of gold collected by Full Metal Minerals during 2006 field work. Presented at Alaska Miners Association 2006 Annual Convention in Anchorage, Alaska. 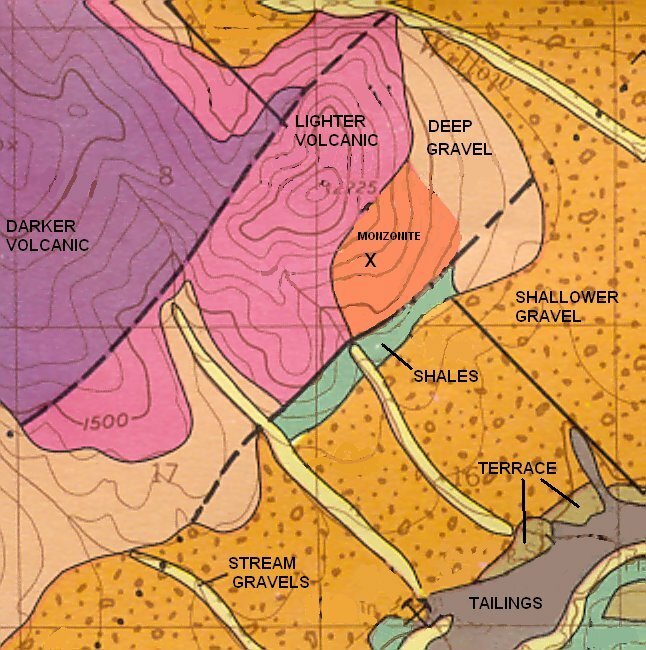 Geology of the Iditarod C-3 Quadrangle, Alaska – T.K. Bundtzen, G.M. Laird, and M.S. 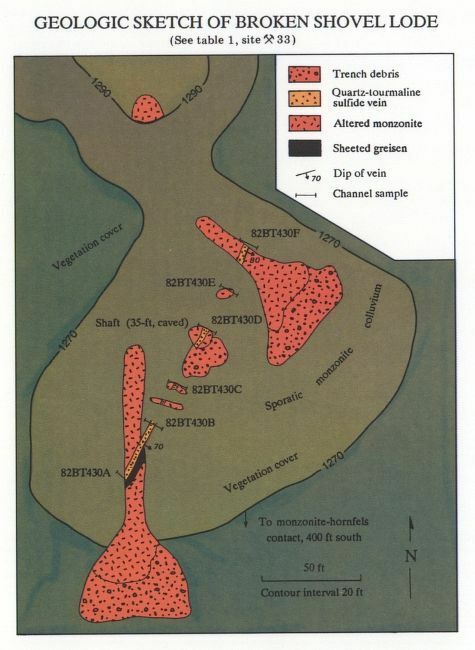 Lockwood., 1988 – A summary of the geology and mineral resources along a 32 km (20 mi) segment of the Nixon-Iditarod fault in the central Kuskokwim Mountains of western Alaska. Alaska Division of Geological & Geophysical Surveys Professional Report 96, 13 pages. Geologic map of the Iditarod C-3 Quadrangle, Alaska – This is the color geologic map and sampling results that accompany the report above. Excerpts below. Important Note: this map is in .sid format which requires that the LizardTech ExpressView Browser Plug-in (MrSID) to be installed before you will be able to view it. The map is a 12MB download. Geology of the Iditarod C-3 Quadrangle, Alaska – Bundtzen, T.K., Laird, G.M., and Lockwood, M.S., 1985, Geology of Iditarod C-3 Quadrangle: Alaska Division of Geological & Geophysical Surveys Public Data File 85-6, 39 pages. This is the preliminary report from which the Professional Report and map above were prepared. Information on the map is included in the text of this document. Precious metals associated with Late Cretaceous-Early Tertiary igneous rocks of southwestern Alaska – Bundtzen, T.K., and Miller, M.L., 1996, Alaska Division of Geological & Geophysical Surveys Public Data File 96-15, 85 pages. Heavy mineral provenance studies in the Iditarod and Innoko districts, western Alaska – Bundtzen, T.K., Cox, B.C., and Veach, N.C., 1987, Alaska Division of Geological & Geophysical Surveys Public Data File 87-16, 25 pages.